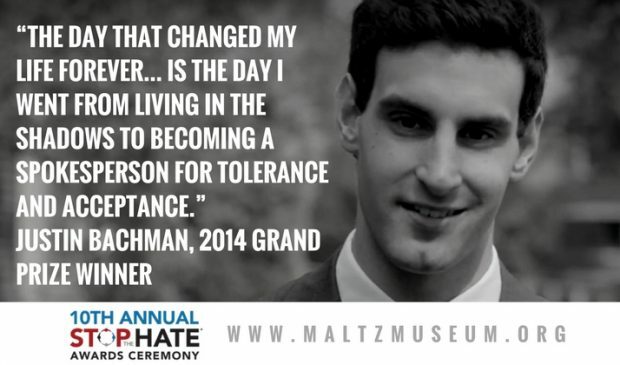 In 2014, Justin Bachman was the sixth Stop the Hate® grand prize winner. Read his essay below and register for the awards ceremony HERE. September 18, 2010, is the day that changed my life forever. That is the day I went from living in the shadows to becoming a spokesperson for tolerance and acceptance. To tell the story, I have to start in 7th grade. I was having “episodes” of uncontrollable movements and noises and had no idea why. After many visits to specialists, I was finally given the answer: Tourette Syndrome (TS). TS causes people to have uncontrollable movements, twitches, and vocal outbursts called tics. Fast-forward to September 18th. I’m at a middle school cross-country meet, listening to the officials reviewing the rules. As usual, I’m ticcing and making noise. The officials were unaware of my TS and thought that I was just trying to be rude and obnoxious. Immediately they told me to shut up. I realized they were not educated about my Tourette’s. I tried to explain it, but was again told to shut up. Long story short, I was disqualified because of a difference that I couldn’t control. They took away my number; three years later I still remember it: 5033. I was devastated. For the first time I realized that not everyone was going to be accepting of my differences. I also realized that I was not the only one facing intolerance because of their differences. I had two choices: be a victim of intolerance or do something about it. I chose the latter and decided to enact change. I wanted to show the world that being different was okay. That change happened in two ways. First, I created an event called The Tolerance Fair. The fair had three goals: bring awareness about other’s differences, provide resources for people dealing with differences, and identify volunteer opportunities in the community. The Tolerance Fair had a very special atmosphere. It was one of the few places that anyone could feel like they belonged, no matter what. At the Tolerance Fair, attendees were educated in many ways. Interactive activities such as wheel chair sports and dance allowed people to experience challenges that others faced through their own eyes. Over 4,000 people attended the 2011 and 2013 Tolerance Fairs. Our goal for the 2014 Fair is 5,000+ attendees. My long-term goal is to hold Tolerance Fairs in cities across the country. The second way I enacted change was by taking my message of tolerance and acceptance into schools (and other groups) through my speech: Living Loud. I share my personal stories to show how great it feels to embrace differences. I believe that my message is very relatable to students because it comes from someone their own age. To date, over 34,000 people have heard my speech. I am very proud of the work that I have done and will continue to do. It is an amazing thing to see a community come together to embrace each other’s differences. I love the work that I do, but my ultimate goal is for it to one day be unnecessary. Stop the Hate® is a contest designed to create an appreciation and understanding among people of differing religions, races, cultures, and socioeconomic backgrounds. By challenging young people to consider the benefits of a more inclusive society, the consequences of intolerance, and the role of personal responsibility in effecting change, the contest also reflects Jewish values of responsible citizenship and respect for all humanity. Each year, the Maltz Museum of Jewish Heritage gives out $100,000 in scholarships, awards, and anti-bias education in recognition of 6-12th grade upstanders in Ashtabula, Cuyahoga, Geauga, Lake, Lorain, Mahoning, Medina, Portage, Stark, Summit, Trumbull and Wayne counties. Register for the Stop the Hate® awards ceremony HERE.